Concise details on the Tarn Gorge Walks EXTRA tour can be obtained by downloading the tour pdf [right]. Alternatively, read the tour description below and click through the sub-headings in the right-hand column for information on arrival and departure, accommodation, what’s included and prices. This tour is launched this year and is a variation of our successful Tarn Gorge Walking tour. Please check out the independent customer reviews for the original Tarn tour at the foot of the Tarn Gorge walking page by clicking HERE. arn Gorge Walks EXTRA is arguably France’s most picturesque inn-to-inn hiking trip in the moderate challenge category – the independent customer reviews (click here and scroll to the foot of the page ) bear strong testimony to that. And don’t think you simply follow the banks of a watercourse – far from it! Our enlightened travellers get to experience Les Gorges du Tarn in their wider geological milieu, comprising the contiguous limestone plateaux of Les Causses Méjean and Sauveterre, in addition to the equally-impressive Jonte Gorge. So escape the crowds and feast your eyes on some of Europe’s most breath-taking scenery and rock formations. Tarn Gorge Walks EXTRA is also designed to indulge your human interest in earlier forms of civilisation and their attendant architecture. And we are not talking simply of dolmen, menhirs and ancient crosses – on one day alone you get to explore caves and a proto-historic village encompassing the Copper, Bronze and Iron Ages. Troglodyte settlements are also high on the cultural agenda. And if that were not enough on its own, the flora is rich and varied, as you would expect from one of France’s most protected National Parks. Moreover, if you are a latent ornithologist, then the avifauna on show is second to none – cue three species of raptor in general and the griffin vulture in particular. Enjoy the majestic site of them gliding from one side of the gorge to the other; and, if you take a midday nap, watch our for your sandwiches! The Tarn and Jonte is France’s only inhabited canyon. You get to stay in the best accommodation that these gorges have to offer, including four nights in three-star hotels, one of which has chateau status – be prepared for a high calorific evening in its gourmet restaurant! Tarn Gorge Walks EXTRA’s first three days are fixed, whilst the second half of the trip allows for options depending on how energetic (or not) you feel as you set off after breakfast – you choose between the high or the low route. The final day is a gentle stroll into the honey-pot village of Ste-Enimie, giving you plenty of time to explore its cobbled streets, boutiques, bars and restaurants that you have earned the right to visit. If you are looking for some spectacular scenery in France’s most remote region, then the Gorges du Tarn is for you – and our in-coming and out-going transfers make your access and departure a cake walk! Fast-track access & departure transfers included. * Transfers on a Sunday, National Holiday or outside normal working hours are subject to a 90euro supplement each way. 3 picnic lunch and 6 evening meals – leaving you free to choose what to select from the gourmet restaurant in La Malène. * Transfers on a Sunday, National Holiday or outside normal working hours are subject to an 90 euro supplement each way. Train to Alès [40 minutes & not part of our package] followed by a 62-mile/100-km transfer to Meyrueis [90 minutes]. All group members must travel together and a supplement of 90.00 euros applies for after 18.00 hrs and Sunday/National Holiday transfers. transfer to Meyrueis from Millau [60 minutes]. All group members must travel together and a supplement of 65 euros applies for after 18.00 hrs and Sunday/National Holiday transfers. The nearest airports are i) Montpellier, ii) Rodez or iii) Nimes. Your departure transfer is included from Ste-Enimie to either Millau [60 mins] or Alès [90 minutes]. 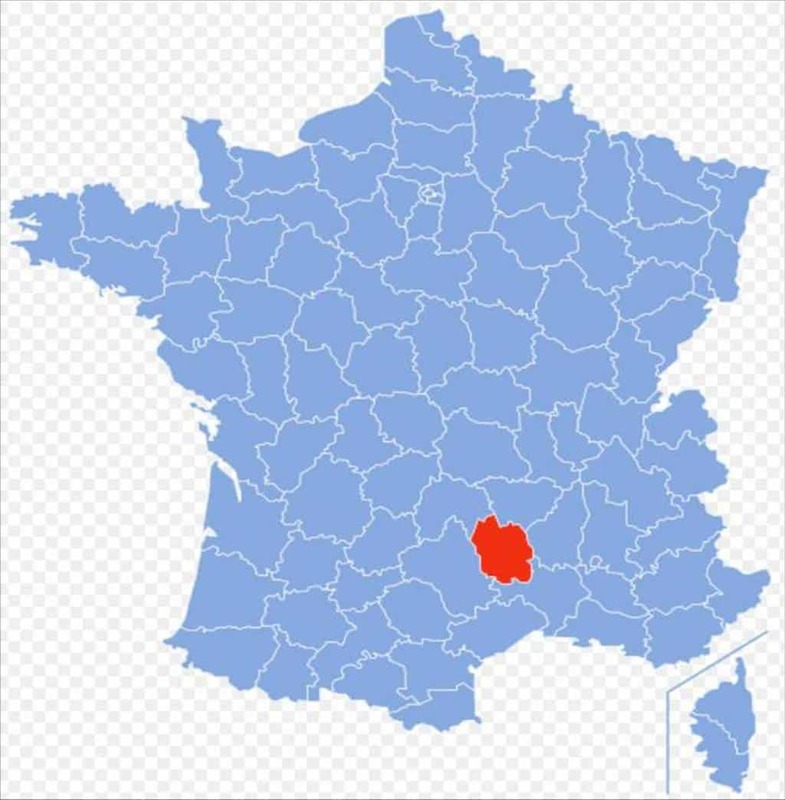 Millau is best for onward travel to Montpellier by bus [90 minutes] or train to Beziers, whereas Alès is best for those wishing to travel to Lyon or Paris. Day 1: Arrive in Meyrueis via either Alès or Millau, from where you are collected. Transfer to your three-star hotel with outdoor pool. Night in Meyrueis. The opening day sees you climb out of Meyrueis with fine views over the gorges de la Jonte. 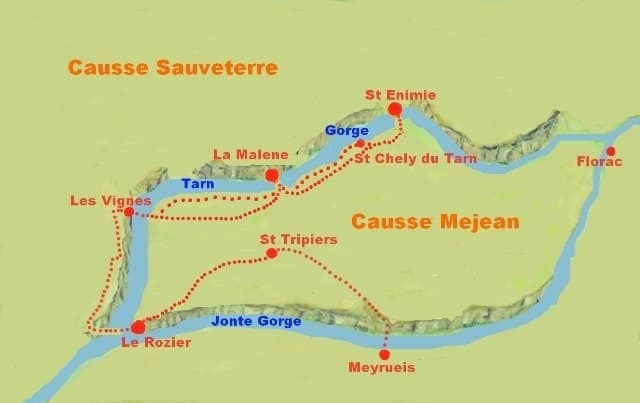 You get your first experience of walking the splendours of the expansive trails of Causse Mejean and visit some fine Caussenarde villages en route. A quick look at the Ecomuseum is de rigeur before striding out towards St Pierre. Night in St Pierre-des-Tripiers or late afternoon collection from St Pierre and transfer back to Meyrueis for second night in Meyrueis. After-breakfast transfer back to St Pierre (if you have stayed in Meyrueis overnight). A real contrast today as you explore grottos and the remains of a pre-historic village before walking the fabulous ‘balcon de vertige’ and its colossal vase-shaped rock forms. There are no metal ladders or chains to negotiate, so just take your time and enjoy the splendid vistas. And it will take longer than the distance would lad you to believe! Two options again, with the same diverse challenge: the gentle and bucolic valley trail versus the Causse and more some superb views from up high. All roads lead to an overnight stay to savour in St Chely, where a heated pool awaits you. Night in St Chely du Tarn. A gentle and scenic stroll above the Tarn awaits you on this final day, en route to the picturesque village of St Enimie. We then recommend an afternoon walk to the cliff-side chapel and a ramble round the historic centre. Day 8: Departure day – end of your Tarn Gorges walking tour – Breakfast, bon retour et à bientôt! Onward journey by transfer to either Millau or Alès is included in your tour fees. The best days involve morning ascents and afternoon descents - well worth the extra effort! Enjoy discovering part of the Cevennes National Park and the opportunity to walk both limestone table-top and the deeply-incised canyons of both the Tarn and the Jonte."